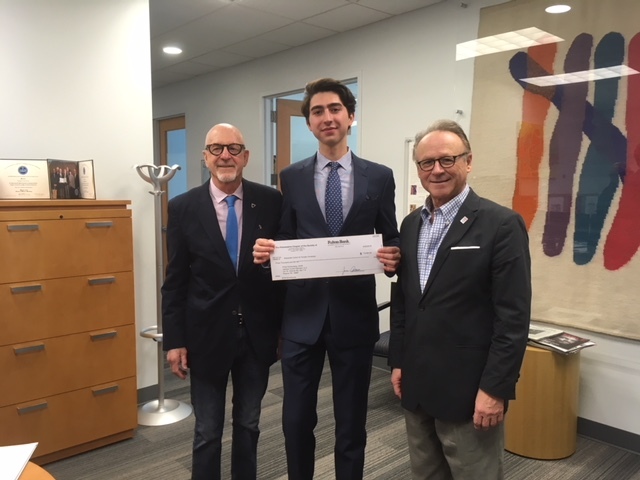 Jackson Cross Partners (JCP) Broker Philip Rothenberg, SIOR, proudly presented the Annual Philadelphia Regional Chapter of Society of Industrial and Office Realtors and the SIOR Foundation (SIORF) scholarship, in the amount of $3000, to Alexander J. Cohen. Mr. Cohen is a sophomore, majoring in Real Estate and Spanish, at Temple University’s Fox School of Business. He hopes to one day own his own real estate investment company. JCP’s Philip Rothenberg, a former President of the Philadelphia SIOR Chapter says this annual event is key for the future of commercial real estate; “SIOR proudly supports students who show initiative in building a strong real estate foundation”. The SIOR Philadelphia Regional Chapter is the leading professional commercial and industrial real estate association. With more than 3,000 members in 630 cities in 34 countries, the Society represents today’s most knowledgeable, experienced, and successful commercial real estate brokerage specialists. Jackson Cross Partners’ Founding Partners, Lou Battagliese, Pete Davisson and John Morrissey, along with Nick Adams are also members of this organization. Philip Rothenberg is an associate with the Industrial Brokerage Team of Jackson Cross Partners. Jackson Cross Partners (JCP) is a multi-dimensional commercial real estate company that offers a unique resource to an organization’s real estate challenges. The company provides commercial property owners and occupiers with a broad range of services including Advisory, Brokerage, and CRE Strategies. For more information, go to www.jacksoncross.com.